Set foot on Antarctica – the seventh continent! Join us on a true adventure to a world of immense scale and visual splendor. Passing huge icebergs in the flat calm of a polar morning will reshape the way you look at your world. Encounter huge whales, enormous rookeries of penguins and stunning landscapes few have ever witnessed. Watch majestic albatross soar by the ship while crossing the Drake Passage. Brave the chill by taking an optional polar plunge. Witness immense icebergs and magnificent glaciers. Have your questions answered by Antarctic experts aboard the MS Midnatsol . Vivid emerald, violet tints, intense blue and crimson light – the Antarctic Peninsula is anything but a world of white desolation. 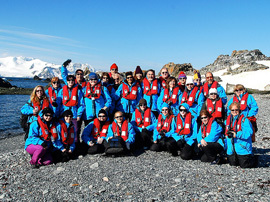 This amazing expedition with a community of well-traveled Jewish Singles will introduce you to the magic of the South Shetland Islands and the Antarctic Peninsula. 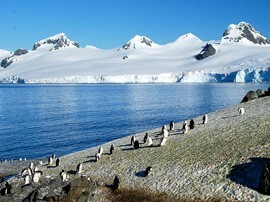 Click here to see a preview video of Antarctica – the Ultimate Amazing Journey! You will arrive in Buenos Aires in the morning. Our adventure starts with an overnight stay in Buenos Aires, the bustling capital of Argentina. We’ll offer an optional city tour in the afternoon. This evening, join us for an Amazing Journeys Welcome and Orientation, followed by going to a fun area of town to enjoy dinner on your own. Early this morning, we’ll be transferred to our charter flight to Ushuaia, the world’s southernmost city. 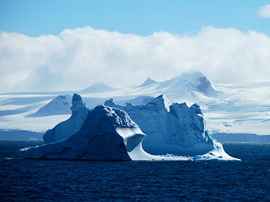 Arriving in this popular and attractive resort town and surrounded by snow-capped mountains, rivers, and waterfalls, we’ll board our exploration ship, the MS Midnatsol for our Antarctica cruise. Once onboard, we’ll kick off our journey with a welcome dinner. 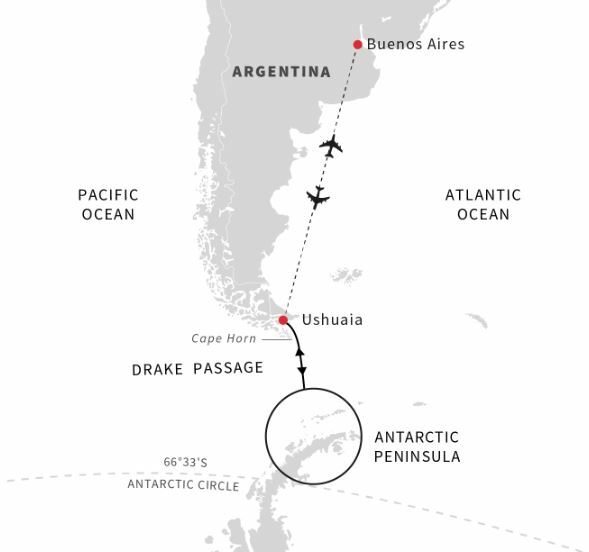 Prepare yourself for Antarctica as we cross the infamous Drake Passage, and trust us – it will take your breath away! Take it all in on board MS Midnatsol with her two-story panorama lounge over the bow, wall-to-wall windows that bathe the room in natural light and provide extraordinary views. Join together for Amazing Journeys activities. Enjoy close encounters with wildlife and glaciers, and visit old whaling stations and its relics. Trust us when we say that every second of this journey has something new to offer. One of the highlights of the South Shetlands is Deception Island. When we sail into the natural harbor of this volcanic island, you will see an abandoned whaling station known as Hektor, and a derelict British base. Paradise Harbor got its descriptive name from the whalers during the last century. Wilhelmina Bay has stunning scenery and is often called ‘Whale-mina Bay’, because of the large number of humpback whales spotted here in December. We have planned plenty of activities to have you experience Antarctica in the best possible way. This might mean that one day you will go ashore to see penguins and hear the crackling noise of glaciers. The next day, you will get to feel the salt and wind as you cruise between the sea ice, looking for leopard seals taking a snooze on the ice. On the third day, you might kayak or take a longer hike or walk. Back on board we also have activities that will satisfy a whole range of interests in the Explorer room. The onboard photographer will show you the basics of expedition photography. After exploring this exhilarating continent, we set course back to civilization. Spend the days at sea recapping your experiences with fellow Amazing Journeys explorers, or just relaxing on deck. In the morning, you will reach the Argentinean city of Ushuaia. Ushuaia is situated on Tierra del Fuego Island south of the Magellan Strait. After breakfast, you will be transferred to the airport for our chartered flight to Buenos Aires with pictures and memories to last a lifetime. There is the potential for rough waters cruising through the Drake Passage. All passengers must be able to get in and out of a Zodiac raft and feel comfortable walking on ice and uneven surfaces without assistance. A deposit of $1900 ($2600 for single) is due with your reservation. Final payment is due on August 8, 2019. Cabins are assigned at time of registration. All the cabins have individual specifications. Those who sign up first receive priority cabin location. Single occupancy cabins are limited. Items listed on this website are subject to change at any time. By providing payment you agree to the terms and conditions as outlined on this website. All staterooms onboard the ship and hotel rooms are non-smoking where we provide roommate matching. Cancellation Policy: From the time of initial deposit until April 1, 2019, there is a $100 penalty for cancellation. From April 2 – July 8, 2019, the cancellation penalty is $500. From July 9 – August 8, 2019, the cancellation penalty is the amount of the deposit. From August 9 – November 5, 2019, the cancellation penalty is 60% of the package price. From November 6 – December 5, 2019, the cancellation penalty is 80% of the package price. Cancellations made from December 6, 2019 until the day of departure and including “no-shows” will receive no refund. There is no refund in the event of interruption or cancellation after the start of the journey. Proof of Citizenship: A passport is necessary to travel on this itinerary. It must be valid for six months beyond the last day of the trip. At this time, no visas are necessary to enter Argentina or Antarctica for US citizens. Argentina is no longer requiring reciprocity visas however should these be reinstated before departure, it us up to the individual to know the necessary requirements. If you are a citizen of a country outside of the USA, you should check with the Embassy of Argentina in your own country for matters pertaining to visas. Currency Fluctuations: In case of currency fluctuations greater than 3% on our post-cruise package, we reserve the right to adjust our prices accordingly in order to operate the tour. Taxes, Surcharges, Government Fees and Gratuities: Taxes, surcharges and government fees have been included in the rate. For your convenience, gratuities have also been included. At this time there are no arrival or departure taxes from Argentina for US citizens. Taxes, surcharges and government fees are subject to change. Air and Airport Transfers: International airfare has not been included in the rate. Flights between Buenos Aires and Ushuaia are included. Arrival and departure Airport Transfers for your international flight are not included. Information will be sent at a later date regarding airport transfers. It is important that you not purchase airfare until you receive a confirmation letter which will contain specific flight parameters.